There are a lot of model airplane wheels on the market, but this package represent the greatest combination of light weight, toughness, appearance, and value. You might be interested to know that these Sullivan Sky-Lites are the same wheels BTE uses on its Reaction 54 turbine model. The aluminum hub in the Du-Bro tail wheel handles the heat when soldering the retaining washers on the tailwheel wire. 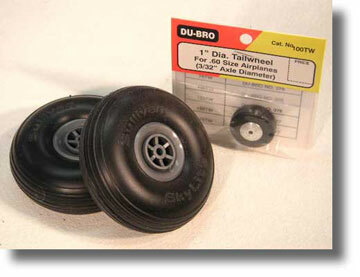 1 TAIL WHEEL: Du-Bro 1"